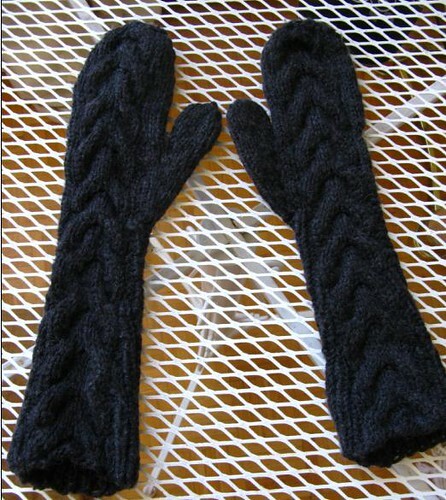 Posted by cheryl in Cheryl, Finished Projects, Mittens. Cheryl says … Actually, I finished these a couple of weeks ago. I would have posted a pic sooner, but I don’t have a camera so I have to rely on Will’s. Can I just say that it’s extremely difficult to blog about knitting when you don’t have a camera??? Anyway, I used Paton’s Shetland Chunky for the mittens and I like the way they turned out. If you look closely, there are white flecks in the yarn and it’s very pretty -and affordable. Right now I’m working on Knitty’s eyelet skirt and I’m about 75% complete. I’ve decided to put the fair isle gloves on hold, because making them would require buying more yarn. I just happened to have 5 balls of Cotton Ease in my yarn stash, so the eyelet skirt made sense. I have nothing but good things to say about this pattern. I was a little apprehensive about the way a knit skirt would look but I’ve been pleasantly surprised. The eyelets look great, if I do say so myself, and the pattern is SO easy to follow. My spring forward socks are about 90% complete, but they’ve been put on the back burner. I’m heading up to Algonquin in a couple of weeks and I hope to finish them then. Let the long weekend countdown begin!